As WCS spreads and grows exponentially worldwide and the dance evolves, the landscape of dance events is changing too. There are more dance activities available on the market now, so in an effort to compete for attention and attendees, events have to be innovative and offer more value. The tried and true formula is still leaving attendees satisfied, but might not be enough to motivate them to keep them coming back. Before my time, (c2000) there were only a fraction of the events we have now, and of course everything was US-based: (for those who might not be aware, the size, availability, and affordability of convention space in hotels is unique to North America: this is not typical on other continents.) The format for large US events is simply not feasible around the world, so a few alternate standard formats have emerged, usually catering to attendance of <400, as opposed to ~400-1200. The smaller the event, the easier it should be to run, right? Ha….Ha…. Necessity was the mother of invention, and events have been working hard to bring something special to their dancers regardless of the size of the space or the attendance. It might be easy to assume that event directors make bank from their events, but most will choke on their beer laughing at this prospect. Everyone is working with a limited budget and restrictions placed on them by the venue, but there are ways that events can upgrade the user experience and stand out on the calendar without (much) financial investment. This is by no means an exhaustive checklist nor an instruction manual telling ED’s how to do their job. My intention is simply to prompt thinking outside the box: to offer a big-picture perspective as someone who has attended and worked for over 700 events and is seeing them evolve. I apologize for not mentioning every single event I’ve ever worked for that had great ideas. I mention (and link) example events that can be credited for using each idea, but this does not mean they are the first or only one to use the idea, nor does it mean that this is the only good idea that they produce. These great ideas could either be borrowed & modified directly or used to trigger brainstorming sessions with your team. Like in teaching, borrow away but be sure to credit your source and make it your own. The generations are shifting, and many Event Directors are either retiring or recharging and re-branding by bringing on fresh leadership blood from a younger, more current generation. Many currently active Pros are getting involved in event leadership to various degrees of responsibility depending on their workload, and the general effect is a boost in status and registration numbers. Flyers on the flyer table used to be the standard, but now are only an accessory. Emails still might be useful, but use sparingly: many event promoters have abused their distribution lists causing many dancers to unsubscribe, block, or simply ignore them. 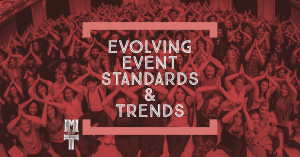 The dominant marketing tools now consist of stand-up banners, t-shirts, event pass prize exchange, and Facebook: the standard networking tool of the dance community. Some events are really maximizing social media tools, and it’s working. River City Swing had a great campaign where they featured a new member of their teaching staff each week with a beautiful consistent filter/frame for event branding. 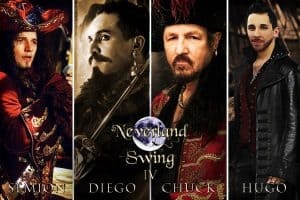 One that captured my attention was Neverland Swing. Also becoming standard: Google-form feedback surveys with link posted on the event FB page. At minimum, your event should have its own Facebook event page, preferably with the year in the title. If managing social media is too much for you, in order to keep up with the flood of images and advertising dancers are all inundated with, I highly recommend consider consulting with or hiring a social media-savvy dancer or expert (such as, but not limited to Clare Levy of WestieMarketing) to coach you on your marketing plan or just take the reigns and manage it themselves. Programs are great for a Championship event or if you have many sponsors, but if not, don’t waste the paper on info that can be emailed or user-printed instead. It used to be common in UCWDC to give away swag as prizes – jackets, beltbuckles, bags, etc (which I’m kinda jealous that I missed!) but the today the standard prize currency is and event passes and cash. 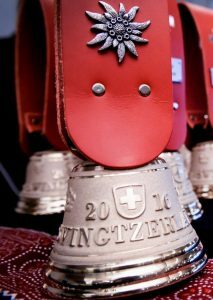 Trophies have graduated from old-fashioned plaques and picture frames to acrylic or custom-glass sculptures, or even more creative symbolic objects such as Swingtzerland’s mug-sized cowbells. Open or self-selected workshops are slowly evolving into levelled and/or a-la-carte workshops, and gendered improv contests are creeping towards extinction. Social media is a quick and lasting way to reach your attendees during the event too: rather than just making annoucements in the ballroom, have someone responsible for posting ballroom updates on the Facebook page. Live streaming is great to include those who couldn’t be there in person, or to deliver a good dose of FOMO (fear of missing out) to motivate them to attend next year. It’s not easy, but closed-circuit TV broadcast from the ballroom sure is nice when you have long days of multi-heat contests to track. What kind of product are you selling? It might help to be really clear and honest about what your product really is: is it a major competition weekend with just a handful of workshops? Or is it a workshop-dominant event with minimal Jack & Jills? How you define your event should guide your decisions about prioritizing and scheduling. it also defines the staff you choose. Not all available pros are strong workshop teachers, and not all seasoned workshop teachers have routines they can perform. Some are known for their friendly, approachable social dancing, while others are a draw for their exclusivity or showmanship. How would you describe your event in one sentence? Being clear about your event’s identity makes it easier for target consumers make their decision about choosing your event. This does not necessarily mean describe the community you are in – it means consider the demographic you want to cater to. Phoenix 4th of July happens to have a substantial Masters demographic and a growing Junior program: their creative solution? An inter-generational Strictly: partners must have 20 years in age difference. City of Angels had an air of grounded classiness that reflected the personality of its founding event directors, Brandi Guild and Ronnie Debenedetta, in aspects such as decor, dress-to-impress Saturday night, and the crystal champagne flute trophies. The After Party aims to serve the competitors and staff who are ready for a stress-relief/blow-off-steam weekend after the intensity of the US Open, so their atmosphere is unapologetically casual and spring-break-ish. ProAms are very prevalent on the east coast, but there’s less demand for it on the west coast, so events don’t need to offer the division. It’s futile to try to be all things to all dancers- you’ll dilute the experience. Straight-up professional WCS performances will be a feature no matter where you are. But what will make your weekend stand out next to the others? An epic pool party (Summer Hummer)? Hosted cocktail party (Palm Springs, Swing Diego)? Costume parade (Swing City Chicago, USA Grand Nationals)? Late-night pyjama-party theme (Swingcouver)? Apres-event field trip (Budafest’s river cruise or Calgary Dance Stampede‘s curling tournament)? It doesn’t have to be a party. How about a solo dance track? Pre-event city tour (a la Chuck Brown at Asia Open)? A particular intensive? Special exhibitions (Liberty Swing)? Live music for comps (Swingtacular)? Ice cream and popcorn outside the ballroom (USA Grand Nationals)? Remember these are simply ideas to add to your existing roster of contests – they are independently optional! Rising Star is a relatively new emerging market. 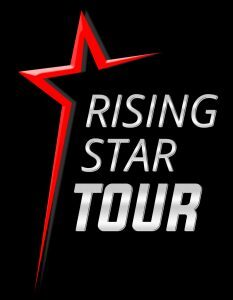 Most events that offer routine divisions now offer Rising Star, and there is even a Rising Star Tour that encourages competitors to travel and track their points as they progress toward Classic and Showcase. WSDC Jack & Jill: it is becoming standard for events to offer “degendered” contests. It might not seem standard in your region, but the global stats say otherwise. Invitational Crossover J&J: Canadian Swing Championships for the best model of this – top dancers from each of 5 styles of Swing are randomly paired and played 3 songs: Lindy Hop, Rockabilly Jive/Boogie Woogie, and West Coast Swing. This was the topic of the article, What Swing Euphoria Looks Like, about the viral video of the epic jam that ensued. Bookends (SwinginNewEngland) & Threeplay (Bridgetown): Strictlies for unisex partnerships/trios/teams: this is a captivating show of stealing/switching/trading roles that could be serious, but is usually hilarious. 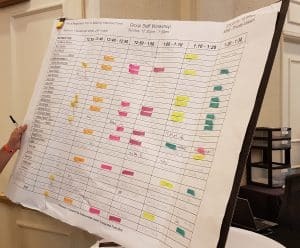 Swing 16 and TopGun (Michigan Classic, TOSHC): Doug Rousar created these creative tournament-style contests, a refreshing reprieve from the standard random draw format. Costume/Gimmick contests: Halloween Swing Thing and SwingCity Chicago are known for their crazy creative and competitive Pro Strictly: instead of being definitively WCS, they encourages dancers to customize their music and create an “act” to match their costumes. The trick is to not sacrifice the dancing for the party. Remember the reason the event exists is to serve WCS dancers who want to see dancers they admire they do WCS, which inspires them to dance and learn more. If you have the Pros participating in a gimmick performance, there should in addition be an opportunity for them to perform legitimate WCS and represent their brand. They are here to stay – let’s face it, they are simply a superior format to the open workshop. But it’s really hard to make an audition process accurate, thorough, and humane (although Sweet Side of Swing is by far the best model for this). So to serve each dancer at their own level without an audition, specialty workshops are the new norm. Newcomer Mama, Kay Newhouse (DC area), has a pretty sweet intensive designed to provide Newcomer dancers a comfortable and encouraging orientation to WCS events (MADJam), and MichiganClassic even has a page dedicated to Beginners on their website. The AllStar dancers had pretty much given up on workshops until events started offering exclusive tracks just for those with the points to qualify. Attendance in each of these two level-segregated tracks has easily doubled each year at events that offer them. One could argue that every workshop is special, but most would shake their heads. A speciality workshop is one that zooms in on a particular aspect of WCS and/or targets a particular subset of dancers, is usually longer than one hour, and usually an extra fee. Examples of specialty workshops we teach: Feminine/Masculine Movement, Lift & Dips, Choreography, Teacher Training (LOL – not our preferred delivery method! ), Crossover for Salsa/Lindy/Ballroom dancers, Music Theory for Dancers, Community Leadership, and our signature Swing Literacy Intensive. 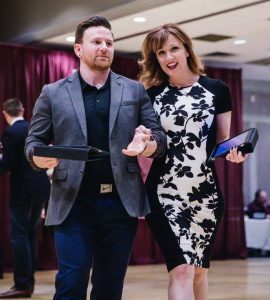 Swingtacular sells a special ticket that dancers can remit to a pro of their choice (during pro-designated times) for 10 minutes of private instruction on the spot. 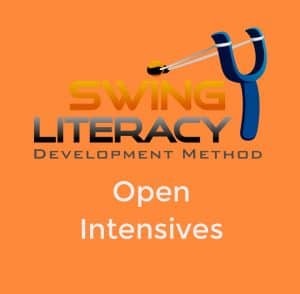 Seattle’s Easter Swing and Sweet Side of Swing each have digital request forms to fill out to collect private lesson requests so Pros can contact students to book lessons. At Boston Tea Party and Tampa Bay Classic, dancers sign up in advance for a 10-minute “micro-private” with one of the teaching staff during an allotted hour on the schedule. This could be revenue or a charity fundraiser. Dancers who can’t afford a full private can at least get a chunk of personalized homework to work on, and teachers get a chance to show off their diagnostic skills to promote future privates. It’s quite exciting to see a buzzing ballroom FULL of learning moments. Lighting is a gift that keeps on giving. The standard hotel ballroom lighting is acceptable for social dance events – it’s ok to DIY. But thanks to HD photography, videography, and Brad Whelan, the lighting of spotlight finals, especially routines, has a massive impact on your potential marketing materials. I have opted in to an event before specifically because I wanted our routine recorded under its lighting and backdrop. When I have excellently lit photos and video of our performances, I tend to share them more, which means more passive advertising for your event. It doesn’t have to be to the awesome standard of the US Open or MADJam, or have a state-of-the-art LED backdrop (Swing Diego), but front spot/flood lights at minimum should be considered. Got routines at your event? Delegate the lighting to a professional, such as (but not limited to) Tom Perlinger of Live Entertainment. Many hotels do not have sufficient lighting options for the transition between day workshops and dark late night dancing. It is worth it to invest in some feature lighting to create ambiance and texture in between. Analog spreadsheet systems are phasing out and making way for programmer’s magic toolkits. Thanks to Dan Krieger of Step Right Solutions one of the pioneers of this evolution, events are now able to accommodate increased registration numbers because the scorer’s program can process the prelim judges’ callbacks to finals in less than a 2-song dance break. A few East Coast events such as MADJam now are having the judges using tablets attached to a real-time scoring program: callbacks are processed instantly – before the competitors even walk off the floor. This system is still working out some kinks, but will in time become the new standard. 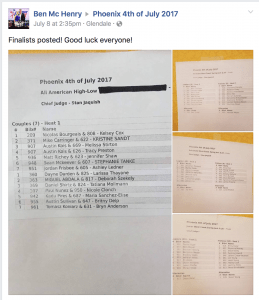 Most events now are allowing people to freely video the contest prelims – this is great feedback for competitors that will never get from a videographer’s camera panning the whole heat. The recording of solo contests is either restricted to the videographer, or to people who have paid for a video pass. Video notebooks could be a way to generate revenue if you work it into your videographer contract, but it might just be cheaper and simpler these days to let people record workshop recaps themselves. I’m probably not the only one who prefers not to see judges’ heads blocking the dancers’ legs in the spotlight videos. I appreciate it when the videographer is positioned front and centre. While you’re at it, consider the sightlines of the spectators who are not at the front tables: investigate renting risers (Swing Diego) so everyone can appreciate the lower body work and floor tricks that West Coast Swing features. Personally, I tend to be hyper-aware of the flow of any system. An easy way to catch missing preparations is by visualizing the flow an attendee would go through during the weekend: how they arrive to the event, check in, find the ballroom, find the bathrooms, get registered, sign up for contests, discover the vendors, secure provisions, book a private lesson, get oriented to the schedule, receive announcements, post selfies on the event page, find the workshop room, find their table/homebase, change their shoes, get a drink, stay hydrated, marshall for contests, find out about callbacks, spectate performances, find food late night, provide feedback at the end of the event, etc. Risk management has always been a part of event management, but these days it is even more crucial to do your due diligence to make the event spaces safe for every attendee and staff member. Here’s a suggestion: recruit an in-house medically-trained first responder to be “on-call” for the weekend – this might be a dancer willing to exchange, but it might need to be a paid position for insurance purposes. The issue that has been in the shadows for decades has finally come to the forefront: consent. This is not just a trend: this is a permanent cultural shift that every public venue needs to make provisions for. Unfortunately, there exists a tiny percentage of the population that poses a threat to the safety of others, and the dance community is not exempt. We are all responsible for “taking care of each other” and “speaking up”, but event directors such as Kay Newhouse have started being more proactive in these efforts by publicizing a Code of Conduct that each attendee and staff member must agree to. It’s a great start! All participants (attendees, staff, and volunteers) value appreciation and having their needs met. Paying attention to the obvious standards and expectations is the easy part, but the magic is in the details. A little empathy and imagination goes a long way, so if you’re not inclined to it, do your best to align with someone who is. I’m SURE there are LOADS of other great ideas out there and I would love to hear them! Please feel free to comment. Thanks for a fantastic article, Tessa! I have a couple other suggestions – I think it is a FANTASTIC idea for every event to have someone on staff or available for medical emergencies. If anyone is reading, I would like to recommend my friend Amber Klispie, who is an emergency room RN, for this task. I believe she has started working events before in exchange for an event pass and access to the hospitality room (as she stays on site the ENTIRE weekend.) At one event, a dancer was having a heart attack and she literally saved her life right there in the hotel. When she told me about it, I was amazed event directors hadn’t been doing this before. So many injuries could happen! How great to have someone of that caliber on site who can help in an emergency. She also fixed me up after *ahem* I drank some not-so-good stuff at my last dance event with some magical anti-nausea pills from her medical bag. Think about how many opportunities there are for people to get ill, drink too much, or get seriously injured at a dance comp. I would highly recommend reaching out to her on Facebook if you are interested in bringing her to your event. Enjoyed reading this and the “Inter-generational and/or an AllAmerican Hi-lo” sounds like a great idea. Regarding the lighting, I wish the lights could be a wee bit brighter for late-nite dancing since I am older and my eye sight isn’t what it once was. Love that you are pointing out the differences and strong points of the many events out there. Seems as if almost everyone wants to be an event director these days, in the way so many decent dancers wanted to be teachers…takes a while for them to weed themselves out. As a teacher who has taken students to comps, mostly ballroom, since the 70’s, it has become difficult to pick out which w.c.s. event to ask student to spend their money going to. I do question this one statement you made…”Remember the reason the event exists is to serve WCS dancers who want to see dancers they admire they do WCS, which inspires them to dance and learn more.” I doubt this is why the event exists and as much as students like to watch their favorites dance,admiration is not really a part of it when it comes to spending their money. Seems as if there hasn’t been very many new faces in the past 15 years and you tube is saturated with them dancing. My point is that maybe if ED’s romanced the teachers by offering something in the way of discounts, or mentions at the event ,or just invite a few to attend without their students with a room for one night…just something to get new business because we are the ones that tell our dancers where we are going. I know it is easier to give attention to those who can bring the most people, but new business is life blood and what creates crowd excitement at events. I’ve not worked the amount of events you have, but have been a staff member of ballroom events from 76-90 and later worked many wcs, lindy, shag and salsa events in the 2000’s. As a result I have seen many ED’s start and succeed as well as many more fail. Being semi retired from a business I love I can tell you that the desire to feel accepted and a part of,not just a spectator, of dance events is a common desire and too often ignored. Thanks for all your work on writing great articles and expressing beautiful dancing. Someone mentioned sound systems. I would like EDs to ensure the well-being of dancers by making sure that the sound levels on the dancefloor and when spectating isn’t excessive or at levels likely to damage hearing. I like to dance all night until breakfast so that’s significant exposure. Having to wear earplugs to protect my hearing for hours and hours is tiresome.